On an outing this afternoon I stopped by the Metroparks' Mill Stream Run Reservation and explored the frozen landscape. I photographed shadows, animal tracks, snow, and the stream. It was 16 (F) degrees so I did not stay for long. Hands sore from the cold, I made my way back towards my waiting car. 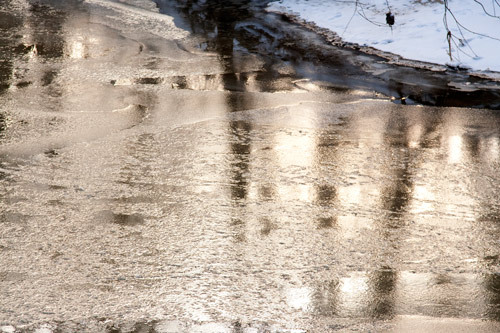 As I crossed the small bridge to the parking lot, I stopped to gaze at the frigid water. For just a moment the ice turned golden. ← A touch of spring? I can imagine 16th century dresses made from golden tissue and embroidered with silver thread! Too lovely! I love the golden water and ice. it looks like liquid gold! And the tracks you photographed. Very unusual. I like the way the snow around the tracks has not been touched. What an amazing color – almost bronze but I have some other metallurgic reference in mind I can't think of right now. 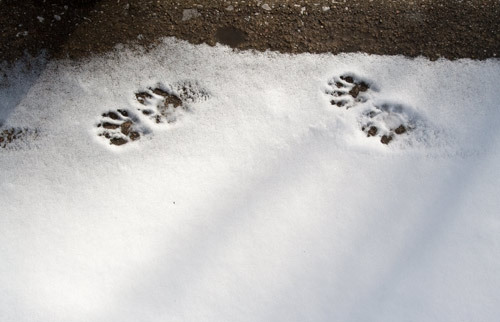 Love the animal tracks – now I have to go check my field guide! I'm always amazed at the beauty of your photos. I don't even SEE the things you do! So cool. Yes, that is one of my favorite parts of the picture. The perfect snow, and the animal tracks!!! Lovely.